Many thanks to those former V-Force personnel that visited the museum for the reunion gathering today; they also go out to the people and groups for providing a host of visiting displays; to the museum volunteers for opening up the aircraft; car parking operations; the museum organisers; our visitors; the #twitterVforce people & the cookie baker; and last but by no means least the museum staff (and volunteers) for their sterling hard work in the café, museum shop and site cleaning/tidying and car parking. 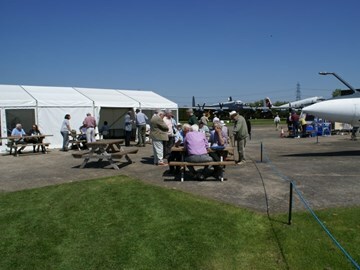 As anticipated from the pre-event bookings, around seventy-five (75) former V-Force personnel attended the event today. Many V-Force Squadrons, bases and aircraft types were represented at the reunion, whilst in the museum’s display hangar 2 hosted a wealth of visiting displays. A special thank you goes out to our four speakers today, who gave some interesting insights into the V-Force and its operations; during four well attended talks in the Dambusters Hut. As ever the museum’s own V-Force veteran, the famous Avro Vulcan bomber XM594 proved to be a highlight for the visitor, along off with an evocative Dakota flypast by the BBMF early in the morning. We have now taken the decision that we will be hosting a #NAMtributeToVforce2020 event in 2 years’ time; but it may be in a slightly different format!